STEM in early childhood education is a newer educational term that we parents see frequently in the news and when talking to early educators. But very few of us understand what is STEM in early childhood, when is it appropriate to start teaching STEM, why knowing concepts of STEM may be beneficial to our toddlers and preschoolers, are there any STEM preschool toys easily available . Today we are going to reveal 7 things that you should know about STEM. STEM Education is a term initiated by the National Science Foundation, referring to an educational approach which combines these four disciplines. Science is a way of thinking. Science is observing, doing experiments, making connections, coming to conclusions, sharing discoveries, asking questions and wondering how things work. Technology is a way of doing. Technology is using tools, identifying problems, trying to solve it, being inventive to make things work. Engineering is a way of doing things. Engineering is solving problems, using variety of problems, designing and creating and building things that work. STEM is a philosophy where educators (teachers along with parents) help kids to learn by integrating knowledge across disciplines and encourage them to think in a connected and holistic way. In the true sense, all children and even adults engage in STEM activities spontaneously without knowing about this term STEM on a regular basis. Science and Maths is everywhere around us. Sun, Moon, stars, climatic changes, mobile, TV, flowers, plants are all related to Science. What we do in our daily lives even simple stuff like buying groceries, shopping for essentials, making investments or filing for taxes involves maths. STEM advocates a blended learning environment and shows children how this scientific method can be applied to everyday life. 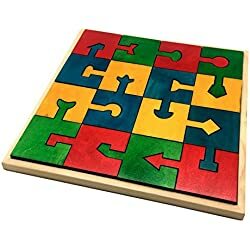 It helps guide and teach children computational thinking, problem solving and learn about the world around them in a fun, challenge-based hands-on manner. STEM is about innovation and experimentation – creating Thinkers and Doers. And We need thinkers and doers in our next generation to solve new sets of problems that will emerge with time, to provide solutions, to sustain our world. Quick fact – According to the U. S. Department of Commerce, STEM occupations are growing at 17%, while other occupations are growing at 9.8%. STEM degree holders have a higher income even in non-STEM careers. Now most of you will be wondering why should I worry about STEM for my baby, toddler or preschooler ? Is it not too lofty a concept ? Right from the time when the infant is first introduced to toys or begins to move in the environment he lives in, learning starts. Their active exploration of the environment and the things in it wires the brain, helping them develop powerful intuitions about concepts of science, technology, engineering, and mathematics. So lets answer – At what age it is appropriate to start teaching STEM ? How can we implement stem in early childhood education ? It is never too early to start teaching concepts. Because babies and toddlers are naturally following STEM principles. What does your baby do when it sees something lying on floor ? He tries to pick it up, observe, try to mouth it, looks at your for reaction, usually smiles after that because he feels he has achieved something and most of the times tries to do it again to see your reaction. Is this not science ?? He is observing, experimenting, making connections, recording results, sharing discoveries, and trying to understand his environment by exploration ? Research shows that having a strong foundation in early math or science concepts can lead to higher achievement in both maths, reading and science later in school. The brain grows faster in the first five years of your child’s life than at any other time in his life? Children are naturally inquisitive and STEM is about using that curiosity to help them learn. Rather than a passive way of learning, making a child experience and learn by presenting him with an opportunity where he/she can learn the same concept in a variety of settings. Everyday practical life skills, environment and all the things in it are instrumental in preparing a child for STEM learning and building their critical thinking skills. Rather than teaching about shapes you can use shape sorter toys or blocks to let a kid experience various shapes and its properties. Rather than teaching about counting you can take your kid to a park and let him collect leaves, stones or flowers and count what he collects. By asking questions to help a child learn concepts – Which ball is smaller ? How many fishes are there in the pond? which ball do you think will reach ground faster if I throw two balls together ? You can use materials easily available at home or open ended learning toys. Scissors, Crayons, paints, bowls, spoon, leaves, flowers and many such materials easily available at home are all tools for kids so you can plan STEM activities with your kid using that. Below I am giving specific examples of how we can use toys for STEM activities. Lets see what all happens when a kid plays with blocks. He understands about various shapes and colours. First he usually creates a tower out of blocks and knocks it down 🙂 .. Which teaches him about one dimension (in which he keeps one thing on top of another). As he grows older, he probably starts making a wall which is 2 dimensional object. And with time kids can create multiple 3 dimensional or complex structures with blocks. 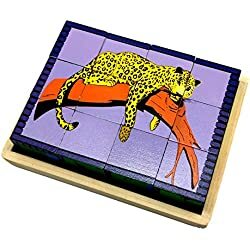 Thus by providing them with blocks you gave your kid an opportunity to explore and inspect various shapes, dimensions, practice his fine motor skills and strengthen his spatial skills. Imagine a simple tower of blocks passes through stages of inspecting shapes from different visual angles, ability to imagine and rotate shapes in their brain to form the tower and the perfect hand-eye coordination. It is simple yet so complex. Building blocks are the ideal creative toy as we construct numerous patterns with the pieces. But this toy is also ideal to develop fine motor skills, develop an understanding of 3D geometric shapes and do pairing exercises with them. When surveying early exploration based Pre-STEM toys in the India market for my 7 month old son, I came across Skola and was quite impressed with their collection. Testing how things work informally is crucial to developing critical thinking. It is during play that children explore cause and effect, spatial and visual perception. Here are some STEM toys that I shortlisted so am listing these out for you, but would suggest you to go through their whole [eafl id=”10914″ name=”Skola Toy collection” text=”Toy collection”] as I genuinely liked almost all toys. Twisty Trio is a complex shape sorter. Complex because child not only practices fine motor skills but also enhances dexterity abilities. 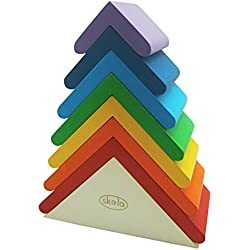 The child has to observe, comprehend which shape would fit, align the shape with the rod, twist it, and then correctly stack the coloured shapes. Although it sounds easy but the concepts of engineering are explored here. This sets the base for spatial manipulation for future careers. For e.g. an astronomer must visualize the edifices of the solar system and the motions of the objects within it. An engineer mentally visualizes the parts of a machine or building that he designs or works with. I loved the fact that what is reflected in all Skola toys is honing the fine motor skills. Fine motor skills certainly helps engineering, but more importantly using fingers helps children have visual perception, enhance focus with concentration, and cognitive ability which is directly a STEM requirement. Early childhood and its link with STEM is irrefutable. Early exposure to STEM supports children’s overall academic growth, develops early critical thinking and reasoning skills, and enhances later interest in STEM study and careers. STEM is everywhere – be in school, at a museum, a library, or just engaging in the natural trial and error of everyday life. You can’t escape it. Let’s not wait another day to expose young children to STEM education. Did you like this article on STEM learning? Have you been following STEM at home with your kid? Do let me know using comments below. Would love to hear from you. STEM is a very important part of early education.The first five years of life are most important. Thanks for making me aware of this concept of Stem learning and how it can be implemented in early education. Skola is definitely a help to a great extent. Loved each and every bit in your article. Such great information. And I also liked all the toys. Thanks for sharing. STEM based learning adds great value in the child’s growing up years. Glad to see so much awareness about STEM education. Great informative article… Surely going to check out Skola Toys for appropriate STEM toys for my toddler.